Cheese balls on the bar at the Levee in Williamsburg. In these tough economic times, it seems that any news story (no matter what it's about) begins with the phrase "In these tough economic times." It started with vacation and travel pieces. "Paying more at the pump" became a prerequisite for any story about family summer vacations. Carpooling and mass transportation coverage followed suit as gas prices soared. Now. since the credit crisis, just about anything is fare game. That said, it should come as no surprise that "in these tough economic times" diners are looking for places where they can maximize a dollar: places with cheap beer and free food. The all-time champ in this category is Rudy's Bar and Grill on Ninth Ave in Hell's Kitchen. Gray's Papaya may have raised the price of its recession special, but Rudy's still serves free franks (a little crunchy in places, but free). The bar has been serving swill since the '30s, and despite several recent "upgrades" such as the installation of a television and a new-fangled jukebox, it maintains much of its dirt bag charm. It also serves the aforementioned free hot dogs and $7 pitchers of the house brand "Rudy's Blonde" for those who aren't too particular about their beer. Another choice spot for a quick dinner on the cheap is the Crocodile Lounge on 14th Street, a sibling of Williamsburg's Alligator Lounge, both of which offer free personal size pizzas all the time and $3 Yuengling drafts during happy hour. 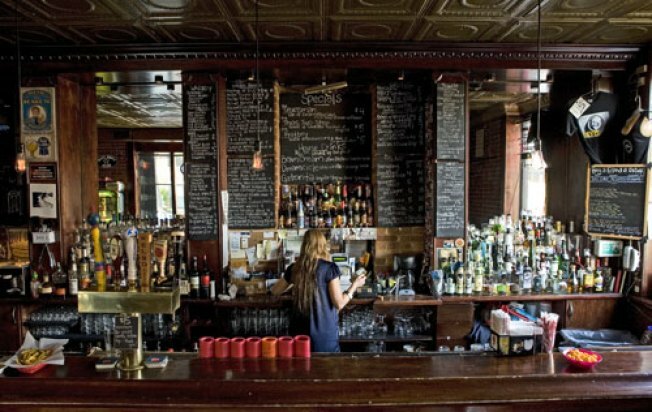 As long as we are on the subject of Williamsburg and free pizza, the Charleston on Bedford Ave offers a similar personal pan pizza for every drink ordered. The key with all of these pizzas is to load them up with the fixin's in a wicker basket that accompany every order. The Levee in Williamsburg, with free cheese balls, licorice and Blow Pops, doesn't offer up the nutritious options of the places already mentioned, but ordering cans of Black Label beer, ordinarily $2 and only $1 at happy hour, might leave a little cash leftover to splurge on their Chili Dogs, Frito Pies, Sloppy Joes, PB&Js and balony sandwiches. The food may be free, but the medical bills will cost you.